Some weeks ago, I was asked on the street, in Lichfield, if I could answer a few questions regarding any professional photographic experiences I might have had in the past. Since I wasn't in a hurry, and I really don't mind answering surveys and stuff, I willingly agreed to spare Venture's employee a few minutes of my time. I'm glad I did!! 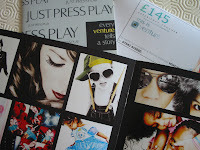 I didn't remember that a prize draw could be at stake just by answering a few questions, until I was contacted this week by Venture's photography studio in Lichfield stating that I had been granted a free voucher worth 145 £ to use in their studios. Can you believe that? I couldn't believe it myself not until I actually received their letter today with the voucher, a small portfolio and a DVD inside. I get to have a family portrait session (I'm wondering if I risk taking the cats...) followed by the digital viewing where I will be able to choose a few to be printed.